The Nikon D90 is a 12.3 megapixel digital single-lens reflex camera (DSLR) model announced by Nikon on August 27, 2008. It is a prosumer model that replaces the Nikon D80, fitting between the company's entry-level and professional DSLR models. It has a Nikon DX format crop sensor. Nikon gave the D90's Estimated Selling Price in the United States as US$899.95 for the body alone and as $1299.99 with the Nikkor AF-S DX 18-105mm f/3.5-5.6G ED VR, which by itself sold for $399.95. Street prices were generally lower. The D90 was the first DSLR with video recording capabilities. In May 2009, the D90 won the TIPA European Photo & Imaging Award, in the "Best D-SLR Advanced" category. Some of the improvements the D90 offers over the D80 include 12.3 megapixel resolution, extended light sensitivity capabilities, live view and automatic correction of lateral chromatic aberration. The D90 is the first DSLR to offer video recording, with the ability to record HD 720p videos, with mono sound, at 24 frames per second. Unlike less expensive models such as the D40, D60, D3000 and D5000, the D90 has a built in autofocus motor, which means that all Nikon F-mount autofocus-lenses (the only exceptions being the AF-80mm f/2.8 Nikkor and the AF-200mm f/3.5 Nikkor, designed for the rare Nikon F3AF) can be used in autofocus mode. The Nikon D90 is the first Nikon camera to include a third firmware module, labeled "L," which provides an updateable lens distance integration database that improves autoexposure functions. Some of its accessories, such as the MB-D80 battery grip and ML-L3 wireless remote, are also compatible with its predecessor the D80. It supports Global Positioning System integration for automatic location tagging of photographs, using a GPS receiver sold separately. Nikon's 12.3 megapixel Nikon DX format CMOS sensor. D-Movie mode (720p, with mono 22kHz sound). Active D-Lighting (4 levels and Auto). 3-inch TFT LCD with 920,000-dot resolution (640x480 VGA) and 170-degree ultra-wide viewing angle. Live View shooting mode (activated with a dedicated button). Continuous Drive up to 4.5 frames per second. Face detection autofocus in live view mode. ISO sensitivity 200 to 3200 (100–6400 with boost). Built-in Sensor cleaning system (vibrating low-pass filter). Support for GPS unit direct connect. File formats: JPEG, NEF (Nikon's RAW, 12-bit compressed), AVI (Motion JPEG). EN-EL3e Lithium-ion Battery, Battery Life (shots per charge) approx. 850 shots (CIPA). Weight: Approx. 620 g (1.37 lb) without battery, 703 g (1.550 lb) with battery. The D90 is the first DSLR with video recording capabilities; it can record 720p high-definition video with monaural sound. However, it does not auto-focus while filming video; to keep a subject in focus, the user must manually track subject motion. Soon after the D90's introduction, many new DSLRs from Nikon and other manufacturers began including video recording as a standard feature. As with other DSLRs, the D90's CMOS sensor captures video frames using a rolling shutter, which may cause skewing artifacts during rapid camera or subject motion. Recorded videos are limited to a 2 GB file size and a duration of 5–20 minutes for each continuous clip, depending on resolution. The first feature film shot with a D90 was Reverie. Ray Mist, the film's cinematographer, praised the camera for its dynamic range, its ability to support 35 mm optics offering greater choices of focal length and depth of focus, and large sensor in comparison to standard video cameras within and beyond the D90's price range. Nikon ML-L3 Wireless (Infrared) remote control, MC-DC2 Remote Cord or third party solutions. Nikon GP-1 GPS Unit for direct GPS geotagging. Third party solutions partly with 3-axis compass, data-logger, bluetooth and support for indoor use are available from Solmeta, Dawn, Easytag, Foolography (Unleashed D90), Gisteq and Phottix. See comparisons/reviews. MB-D80 Multi Power Battery grip or third party solutions. Various Nikon Speedlight or third party flash units. Also working as commander for Nikon Creative Lighting System wireless (slave) flash. Tethered shooting with Nikon Camera Control Pro 2, Adobe LightRoom 3 or other partly free products, including mobile applications. From the camera's rear, the Nikon D90 interface has the following features which are annotated in the image. Help/protect button. Use in conjunction with the main command dial to change the white balance setting in certain modes. Thumbnail/playback zoom out button. Use in conjunction with the main command dial to change the equivalent ISO sensitivity setting in certain modes. Playback zoom in button. Use in conjunction with the main command dial to change the picture quality and size setting. Information display/quick settings display button. Show the information of the camera on the rear LCD screen (shutter speed, the remaining exposures, AF-area mode, etc.). Control panel. Main display for information (see #9). Delete button. Can be used to delete photos or format the memory card. The Nikon D90 has been tested by many independent reviewers since its introduction. Most reviews of the D90 have been positive, assessing the D90 as a notable improvement over its predecessor, the Nikon D80. The camera received 4 stars out of 5 in CNET's editor review and Photocrati's Nikon D90 review labeled the D90 a "best value" DSLR. Digital Photography Review also published a highly positive assessment, but noted that the only weakness seemed to be that matrix metering on the D90 is tied too strongly to individual focus points, and therefore allows highlights to be clipped in other areas of an image. In DxOmark's camera sensor RAW image ratings, the D90 achieved a score of 72.6, placing it above its competitors and more expensive cameras such as the Canon EOS 1D Mark III (71), Canon EOS 5D (70.9) and Nikon D300S (69.8). Statistics from Photo sharing website Flickr also show that the D90 is ranked as the most used Nikon system in terms of picture uploads. As noted above, one of the most notable features of the Nikon D90 is that it is the first digital SLR camera to include high definition video capabilities. While most reviewers gave the D90's HD video high marks, Nikon expert Thom Hogan noted that the HD video capability, while novel, was not yet refined, providing only mono sound, and being subject to video flaws such as apparent distorted motion of stationary objects when panning. ^ "Nikon D90". Digital SLR Cameras products line-up. Nikon Corporation. ^ "D90 from Nikon". Nikon D90 product page. Nikon Corporation. Archived from the original on 2013-09-09. Retrieved 2009-10-26. ^ "Google Product Search: Nikon D90". Google.com. Retrieved 2012-12-18. ^ "Google Product Search: Nikon D90 with Nikkor AF-S 18-105mm". Google.com. Retrieved 2012-12-18. ^ "Nikon D3X and D90 Honored with TIPA European Photo & Imaging Awards". Nikon D90 news archive. Nikon Corporation. 2009-05-07. Archived from the original on 2010-01-14. Retrieved 2009-10-25. ^ Busch, David D. (2009-04-14). "The Nikon D90, D5000 and Nikon's "Secret" L Firmware". Retrieved 2009-10-25. ^ Grunin, Lori (2009-04-10). "Nikon Mystery Firmware Unmasked". CNET. Retrieved 2009-10-25. ^ "Distortion Control Data". Distortion Control Data firmware update. Nikon Imaging. 2010-11-01. Retrieved 2010-12-09. ^ Rockwell, Ken. 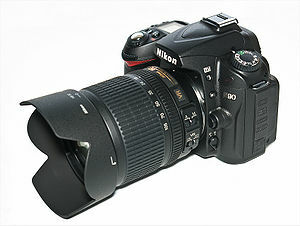 "Nikon D90". Retrieved 2009-10-25. ^ Rockwell, Ken. "How to Use Nikon Strobes Wirelessly, for Free!". Retrieved 2009-10-25. ^ Barnett, Shawn; Etchells, Dave; Weidelich, Zig (October 20, 2008). "Nikon D90 Video". The Imaging Resource. Retrieved 2010-07-18. ^ Mist, Ray. "An Examination of the Nikon D90 (Refined)" (PDF). Retrieved 2009-10-25. ^ "D90 accessories". Nikon USA. Retrieved 2011-08-18. ^ "DSLR Camera Remote Lite". Pcworld.com. 2012-12-14. Retrieved 2012-12-18. ^ Nikon D90 User's Manual (English) (PDF). Nikon Corporation. p. 23-25. ^ "Nikon D90 – Digital Camera Reviews". DigitalCameraTracker. 2008-08-03. Retrieved 2009-10-25. ^ "Nikon D90". Dcviews. Retrieved 2009-10-25. ^ Grunin, Lori (2008-10-02). "Nikon D90 (with 18-105mm lens) Digital camera reviews". CNET. Retrieved 2009-10-25. ^ Burian, Peter K. (2009-02-19). "NIKON D90 Review: Field Test Report". Photocrati. Retrieved 2009-10-25. ^ Richard Butler & Simon Joinson (2008-10-13). "Nikon D90 Review: 36. Conclusion". Digital Photography Review. Retrieved 2009-10-25. ^ "Camera Rankings". DXO Mark. Archived from the original on December 8, 2009. Retrieved 2009-12-16. ^ "Camera Finder". Flickr. Retrieved 2012-12-18. ^ "Camera Finder: Nikon: D90". Flickr. 2012-09-20. Retrieved 2012-12-18. ^ Hogan, Thom (2008-11-06). "Nikon D90 Review". Retrieved 2009-10-25. Wikimedia Commons has media related to Nikon D90 and Taken with Nikon D90.